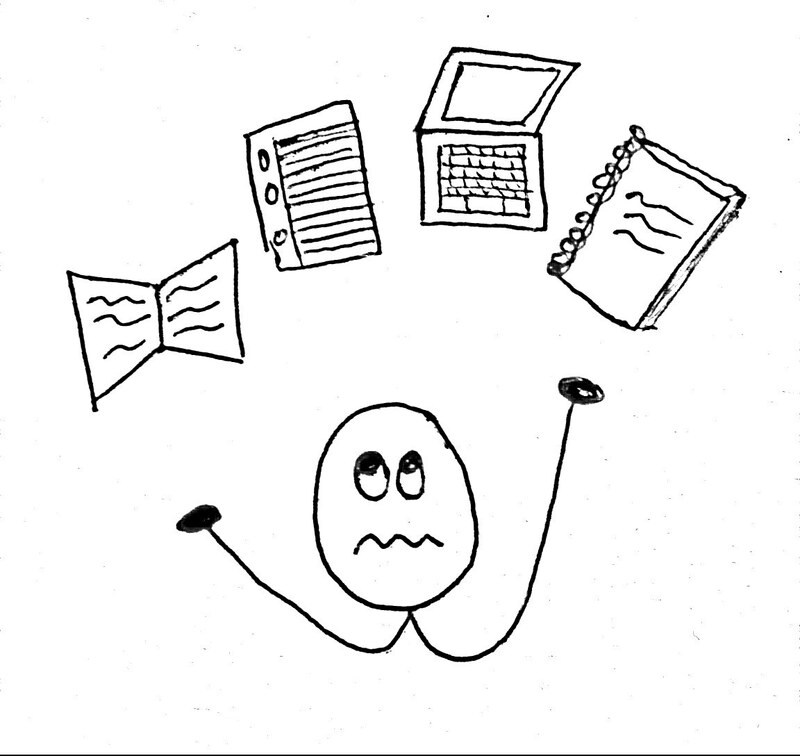 Is School An Overwhelming Juggling Act? Uncover the effective, passionate, self-sufficient learner you already are. 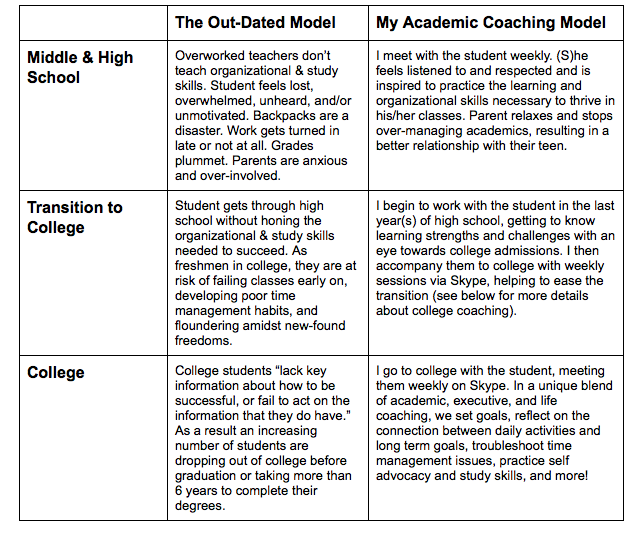 To read a fascinating study of the effects of coaching on college students, click the chart. What’s the difference between academic coaching and tutoring? Tutoring is about mastering a specific content; academic coaching is about honing the learning process. Whereas a tutor explains a subject in more detail, an academic coach investigates what is causing the learning interruption. The coach then teaches new skills and perseveres until the student has integrated both the new habits and the ability to problem solve independently the next time a learning challenge presents itself. Read more here. How do we get started with coaching? Step One: Contact me for a 15 minute consultation. Step Two: Schedule an hour-long consultation for parent and student in your home (either in-person or via skype). Our goals for this meeting are a) to see if we’re a good fit, b) for me to see the student in his/her “natural habitat,” and c) to set a clear focus for our work together. Step Three: Schedule 6-8 sessions during which I learn the nitty gritty about the student’s strengths and challenges, we practice new skills & habits, and we measure them on a unique coaching tool I call The Habits Graph. THE CHECK-IN. How are you doing (as a person, not just as a student)? THE HABITS GRAPH. How well are you following through on your habits this week? We will document growth in a visually-compelling graph. SKILL BUILDING. What skills need practice so that you can rock the next week? ACTION ITEMS. What action items will you commit to during the next week? How many sessions does a student need? This differs, of course, from student to student. Some clients only need a booster set 6-8 sessions centered around a specific goal. The majority of my clients, however, see me weekly for the duration of the school year and beyond. The longer we work together, the more able the student is to fully integrate habits into his or her life. How do virtual sessions work, and are they really as effective as in-person sessions? I know it seems counter-intuitive, but my experience is proving that virtual sessions are often as good, or better, than in-person coaching. Thanks to GoogleDocs, screen sharing, video chatting, online drawing tools, and more, virtual clients stay busy throughout the session. Read more here. 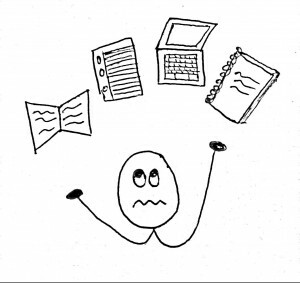 Do you also work with adult learners? Yes! Adults who are going back to school are a favorite client of mine. They usually have a short term need, and we are able to solve their problem during within 5 sessions. Please contact me to find out more!